EVE University is one of the great cornerstones in EVE, dedicated to training new pilots in the many ways of EVE Online. Their amazing guide on Planetary Interaction has been pointed out before, and after following the advise of the Mule and reading through the guide, I wanted to post it here because it truly is exceptional! So last night, in the midst of all the Planetary Interaction excitement, word went out through our Alliance that we should all keep our eyes open for a few good new Wormholes which we could potentially colonize. Since I had little else going on I fired up the ol’ Buzzard and went a scanning! I started in our home system and branched out from there. It didn’t take me long to find a good candidate. About 2 jumps away I found an Unstable Wormhole that was nearing the end of it’s life-cycle, nonetheless I fearlessly jumped on through. I landed in a simple Class 1 Wormhole that was unoccupied. Now C1’s are not very desirable as Star Defender and p@tsh@t have pointed out, but I figured I was a little rusty so I should scan the system down for practice. After looking at dotlan maps I could tell that this system had been dormant for quite some time. A cursory scan revealed roughly 20 combat sites and another 30 signatures! I spent the next 2 hours scanning down each one to shake the rust off and see what else we had. I was initially interested in this particular system from a PI perspective since it had quite a good mix of desirable planets that were not as common in Hi-Sec…at least in our neck of the woods. When all was said and done I found roughly 10 Gravametric (mining), 10 Ladar (gas), 2 Magnometric (salvaging), 5 Radar (Hacking/Archaeology) and 3 Unstable Wormholes. It was quite painful at times, but I was able to lock down most sites pretty quickly. In the end the system just didn’t quite offer what we were looking for in terms of a new system, but it was a great evening for me to get back in the swing of things. I’ve been scanning constantly in Hi-Sec, but it’s not quite the same as landing in a new system with 30+ sites. If the entrance WH had a little more life left in it, and if my wife would have let me, I would have jump back in and started running some of the Grav & Radar sites. There was lots of ISK to me made last night, but alas it was not to be. We’ll just have to see what tonight holds. By now Tyrannis should be live and many a happy Capsuleer is downloading and patching to the latest and greatest release from CCP. 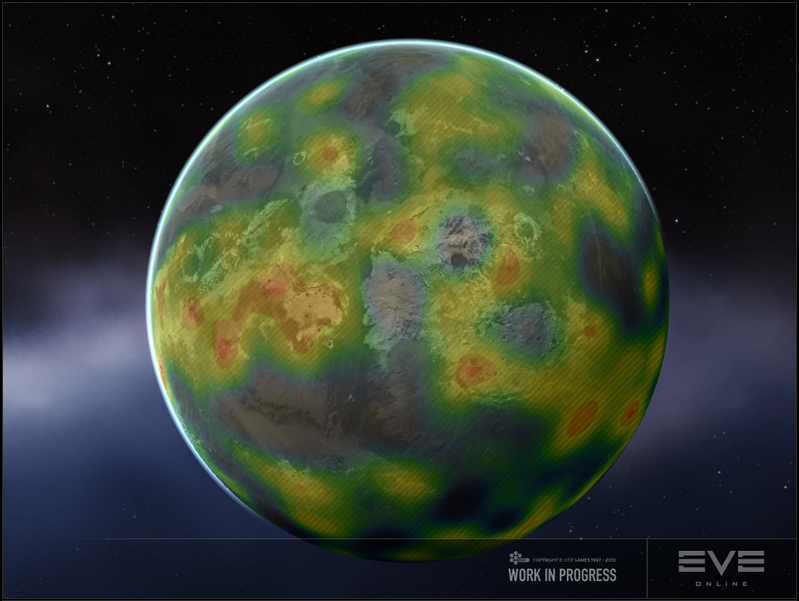 The release of the Planetary Interaction (PI) feature will finally give us the chance to interact with our, as of today, merely “cosmetic” Planets in New Eden. A few new skills have been added which allow us to scan a planet for various materials and subsequently construct a Planetary Command Center where we can mine said minerals and begin to manufacture the various economic goods that were previously only “created” by the NPC market. The extent of my Industrialist Spirit so far has been a few meager mining operations in Hi-Sec and WH as well as some manufacturing and invention runs. Thus I can’t say I have a full understanding or grasp of the complexities in EVE Industrialism. However, as with anything so new and exciting, I’d like to do my best to jump into this new feature from the ground up and be a part of the massive “land grab” that will take place in the coming days. So let the patching and training begin! I figured I’d write a post on how I’ve found to make ISK in EVE Online, similar in fashion to my previous entry on starting an Alt. Being a fairly casual player and only having played for about a year it has taken me quite awhile to identify ways of making money. There are plenty of write-ups and discussions on this topic, but I figured I’d present my practical approach on how I discovered these activities and who they generally apply to. This is pretty much where any new player starts. When I first began I didn’t fully comprehend what all mission running offered me. What I eventually figured out was that running missions increased your standing with whatever Corporation the Agent was associated with. As your standing increased you were granted access to higher level Agents which offered larger payouts, loyalty points and standing increase. Higher level missions were obviously more difficult to complete, but offered better loot and salvage. As your standing increased this also lowered the amount of tax incurred by the given Corporation when doing things like refining ore or items. The first thing I discovered was Salvaging. I trained the skill so that I could salvage the wrecks of the mission NPC ships. I eventually found that the best way to proceed with mission running was to have a ship that could dish out and take lots of damage thus completing the mission as fast as possible. I then purchased a Destroyer and fitted it with 4 Salvagers and 4 Tractor Beams. I would then return the to mission location and collect everything of value I could. I found this to be a great start for me as a new player. As I began to expand my knowledge of EVE in general I latched onto the concept of Mining. I did as much research as I could and did my best to train up the necessary skills for ships and mining that offered the best return. I only mined in Hi-Sec focusing on Veldspar and Scordite. I would run missions until I received one that had lots of asteroids in the mission room so I did not have to compete at asteroid belts. However if I did mine at asteroid belts and if I was in a 0.7 security status system or lower I would anchor Giant Secure Containers at the asteroid belts so I could fill the containers up with ore and then come back in a hauler instead of running back and forth in my mining ship. Hi-Sec ores do not have a very significant return, plus my corporation standings were not very high so I was losing a lot of minerals in the refining process. Ultimately it would have been better if I simply continued running missions as the level 4 missions have great payout in terms of rewards, bounty, salvage and loot, sometimes upwards of 20 million ISK per missions. That is well above anything you can make mining in Hi-Sec then refining and selling the minerals. Eventually I learned of the scanning mechanism. This involves fitting a Probe Launcher and scanning out a system for Cosmic Signatures and Cosmic Anomalies. I really enjoy this particular activity as it’s best tailored to my schedule. You mainly want to focus on finding Cosmic Signatures, as these sites offer the biggest and best rewards. You will typically find Radar (Hacking skill), Magnometric (Salvaging Skill) and Combat sites. Occasionally you will find a Gravametric (Mining) or Ladar (Gas Mining) sites. My favorite are the Radar or Combat Sites (Complexes, Plex). As the materials that can be found in the Radar sites can range in value from 3-15 million per unit. Also, running Combat sites typically leads to what is called an Expedition. Sometimes when running combat sites when you kill the final NPC ship, or (more often) destroy a structure (Communications Towers are good ones to try) you will receive a popup message saying you’ve intercepted a communication or tracked extra enemy ships to another system. You will then be able to find an entry in the Expeditions tab of your Journal. The next steps involve traveling between 4-15 jumps away from your current location to engage in a small combat site, which can be ‘warped to’ from the entry in your Journal. This leads to another small combat site 4-15 jumps away and so on. Once you’ve done about 3 or 4 of these chained sites you will get a final combat site which is typically in Low-Sec so be careful. The last site yields a special commander ship which Faction or Deadspace loot which sells very, very well. Some loot cannot be sold on the market, so be sure and check contracts for a specific item. What I typically do is check out the exceptional EVE mapping site DotLan Maps and see how many NPC’s have been destroyed in a given system recently. I will then typically head out to systems that have not been very active potentially indicating that lots of good scanning sites will be available. This activity can be very lucrative, however I am very bad at it. It involves using the Market to identify items that can be sold in a number of ways to make a profit. You can identify items that have low Buy Orders which you can place and once (if) they are fulfilled you can then turn around Sell the items for a larger amount. You can also find items that sell very low in one location which you can then transport to another location and sell higher. This is a very complex topic and one I have very limited exposure to, but if done correctly and if you put in a good amount of time, research and effort you can make a lot of money. I typically went the route of placing Buy Orders for items and then immediately turning around and selling them for a profit. This particular method can be quite taxing as you have to “babysit” your orders because people will undercut or overcut your prices by 0.01 ISK at times forcing you to modify your orders. Again, there are many methods that work here, I’m just touching on the one method that I tried and had limited success with. So those are the 4 main areas I’ve found and used to make ISK in EVE Online. Again, there are TONS of write-ups on these subjects that offer much more detailed accounts and instructions. Yet I just wanted to list out the methods I found as a new player coming up through EVE and what worked for me. Please feel free to add your thoughts and what a new player could do to make ISK in EVE given no previous experience. Well the move was a complete success! My shiny new Orca, which I’ve dubbed ‘Spaceball 1’ was delivered in the middle of last week. Man is that thing huge! I was able to pack up everything except a single hauler with around 90% room to spare in the hold. I then had to make the trip of 30+ jumps down to our new base in Minimatar space. It wasn’t as painful as I thought, but it’s wasn’t quick by any means. Since then I’ve been doing my best to settle in to my new surroundings, but alas I feel so out of place. Like I’ve said before I’ve always been in Caldari space, since day-1, so all my standings and Agents and sense of direction are gone now. To ease in slowly I’ve taken up scanning the local systems. I’ve found a few good bounties and loot, plus it’s helped me know the area better. My next step is going to be running missions to raise the local standing as I really miss my perfect refines and 0% tax rate. For kicks I decided to fit out an Amarr frigate to see how it handles level 1 missions. Turns out the ammo-less abilities of the Energy turrets are amazing! I’m always dealing with ammo problems and thus I might have found my next set of skill plans. My Caldari missle boats are doing pretty well, but I have no Gunnery training, thus when I go that route I think I’ll head down the Energy Turret tree. My Capacitor skills are nearly maxed so that helps as well. Does anyone have some suggestions on my thought of cross-training Missles(Caldari) with Energy Turrets(Amarr)? Granted my Shield skills nearly maxed and I have decent Active Armor Tanking skills, but those would also have to be beefed up slightly going with Amarr ships. But the draw of not dealing with ammo reloads again is just too much to pass up! Yes I know, that’s a completely unoriginal title, but what can you do. The idea of flying an Orca has always been in the back of my mind. I’ve had the skills to fly one complete for nearly 2 months now but never (so I thought) had the funds to purchase one. Well it’s funny what a little motivation can do. In the middle of last week I finally decided it was time to pack up and move down South to join the bulk of active Alliance members. To do that I’d need a big, big truck…but one I could actually fly. Finally I decided it was time to bite the bullet and get an Orca. Thankfully a member of my Alliance can make them offered me a great price if I could supply all the minerals. That turned out to be quite a logistical nightmare, but things went very smoothly as there were a number of helpful Alliance mates on and it was a quiet night to move bulk goods around. I liquidated all my goods and to my surprise I had a lot more assets than originally thought, somewhere around 600M ISK, which is nothing to sneeze at for a meager Capsuleer like myself. I had more than enough cash to purchase all the minerals on the market and saved probably 40M ISK in the long run on the overall cost to build the big bird. My Orca is now snuggly in the oven and should be ready for deliver within a week. I can’t wait! In the mean time I’ve been running as many Plex’s as I can and find and have been quite lucky as of late. I had a Worm BPC drop for me last night, so I’m stoked about that. I’m not much of a drone guy, but will be soon. I’ll let you know when the move is complete!